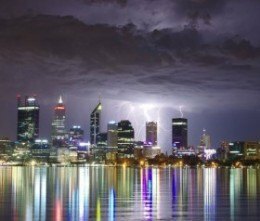 Freak thunderstorms in a Perth summer…how secure is your infrastructure? Home > News > Freak thunderstorms in a Perth summer…how secure is your infrastructure? Not only are storms becoming more regular and severe in winter, but freak summer storms are taking their toll. Storms across the country have had a major impact on business operations. 90% of organisations that experience a computer disaster and don’t have a survival plan go out of business within 18 months. Moncrieff can provide you with an IT infrastructure assessment that will avoid these issues as well as provide your business with a deliverable, comprehensive executive summary. Contact us today to arrange a detailed IT audit.